New Utah Gardener: It's Not Too Late! Several people have asked me if it's too late to plant peas. Definitely not! We always hear that you have to plant your peas on St. Patrick's day but that doesn't mean that's the ONLY time. In fact, you can plant peas all Spring long and enjoy fresh peas all Summer long! These rainy days are perfect for planting peas - obviously - because of the free water from the sky. I like the sugar snap peas, so that's all I usually plant. However, shelling peas and snow peas are awesome, too. IMPORTANT TIP: Keep track of what kinds of peas you have planted and where, either by mapping them on paper and saving it in your garden file, or creating labels that go in the garden to mark the varieties of peas. There is a good reason to do this; you will forget which peas are which and you will let the snow peas grow too ripe or you will be shelling the sugar snap peas or you will try to eat the whole pods of the shelling peas. Been there, done that. ANOTHER IMPORTANT TIP: Peas are legumes so they add nitrogen back into the soil instead of using it up the way other plants do. Nitrogen is one of the main nutrients plants get from soil contributing to plant growth. So if you have a place in your garden that has been previously occupied by "heavy feeders" like tomatoes, plant some peas there to replenish the nitrogen. AND HERE'S ANOTHER IMPORTANT TIP: Peas need something to climb on. So, after the seeds have sprouted, put 2' stakes or tomato cages or something in the ground near them so they can grow up. 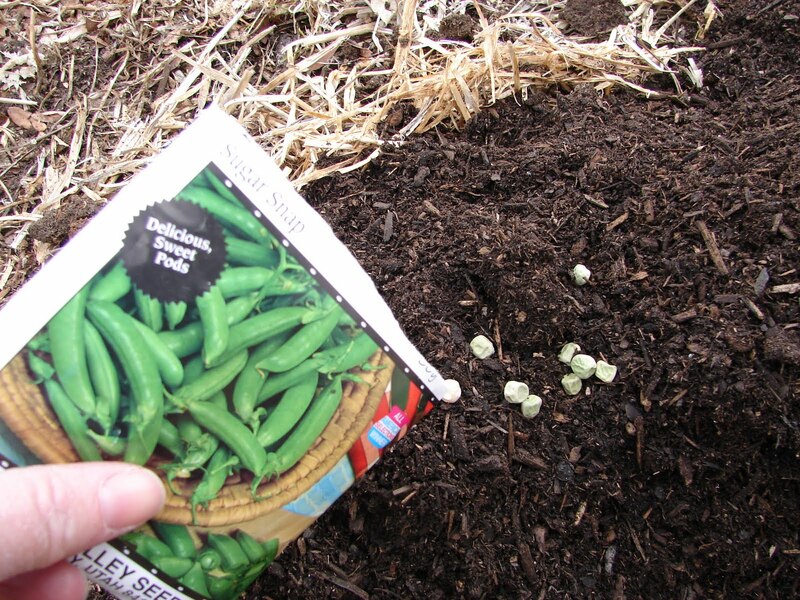 ONE MORE IMPORTANT TIP: Read the planting instructions on your package of pea seeds. They will tell you about depth and spacing and thinning. Also, keep soil moist after planting for successful germination.